Summary: Greer Hennessy is a struggling movie location scout. Her last location shoot ended in disaster when a film crew destroyed property on an avocado grove. And Greer ended up with the blame. Now Greer has been given one more chance--a shot at finding the perfect undiscovered beach town for a big budget movie. She zeroes in on a sleepy Florida panhandle town. There's one motel, a marina, a long stretch of pristine beach and an old fishing pier with a community casino--which will be perfect for the film's climax--when the bad guys blow it up in an all-out assault on the townspeople. Greer slips into town and is ecstatic to find the last unspoilt patch of the Florida gulf coast. She takes a room at the only motel in town, and starts working her charm. However, she finds a formidable obstacle in the town mayor, Eben Thinadeaux. Eben is a born-again environmentalist who's seen huge damage done to the town by a huge paper company. The bay has only recently been re-born, a fishing industry has sprung up, and Eben has no intention of letting anybody screw with his town again. The only problem is that he finds Greer way too attractive for his own good, and knows that her motivation is in direct conflict with his. Summer is quickly approaching! I can definitely tell because the weather here has been unseasonably hot and humid, but I also know because BEACH TOWN by Mary Kay Andrews is now available. It seems like Ms. Andrews always has a fun book just in time for summer escape reading. This one is no exception. BEACH TOWN tells the story of Greer Hennessy, a movie location scout, who is trying to prove herself after a bad experience on her last movie. She is tasked with finding the "perfect" beach town on the Florida coast for a major motion picture; and by "perfect," I mean undiscovered. Not exactly any easy thing to do in Florida where every town seems to be built up for tourists! Greer eventually finds the perfect town on the Florida gulf coast where's there an old hotel, a marina, and a fishing pier with a deserted casino. All of it is absolutely perfect for the director's vision -- even the deserted casino is ideal for the film's climax where he wants to blow up a building. It all seems to good to be true! And then Greer meets the pesky (and very handsome) mayor Eben Thinadeaux. Since BEACH TOWN is part rom com, it shouldn't surprise you that there is some tension between Greer and Eben. They disagree on destroying the casino... among other things! However, the chemistry between the two complicates things; and they aren't entirely sure what's right and what's wrong when it comes to saving the casino and their feelings for each other! One thing's for sure when you pick up a Mary Kay Andrews' novel -- you know exactly what to expect. Her tried-and-true formula for writing fun and sweet books has worked has given her a great deal of success. And BEACH TOWN certainly fits right in with what fans have come to know and love about her novels. This book is very entertaining and a wonderful way to spend some time by the pool or beach! I enjoyed BEACH TOWN quite a bit. My only regret was reading it before my vacation next month. I liked Greer and found her job to be interesting -- it was fun to get a glimpse into the world of movie making. I also really liked Eben and especially the on and off again relationship between the two. It was funny, and at times, a little sweet. Of course, the course of true love never did run smooth; and Greer and Eben certainly had to overcome a lot, including some pesky people who wanted to keep them apart. Another good thing about BEACH TOWN was the setting. I loved this little beach town hidden on the Florida coast and it was the perfect place for this story to take place. It was almost as if this town was stuck in the past... and I mean that in a good way! The buildings and the town's citizens were eccentric and extremely interesting, and I found myself wishing I could experience this town. My only issue, if you can really call it that, with BEACH TOWN was the length of the novel. This was a pretty big book coming in at over 400 pages. As cute as I thought the book was, I could have done with a little less pages. But remember, I'm of the mindset that most stories can be told in 300 - 350 pages. BEACH TOWN is a great summer read, filled with humor and romance! Highly recommended to fans of Mary Kay Andrews and rom com books! 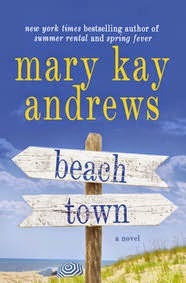 Make sure you stop by tomorrow for a fantastic guest post from none other than Mary Kay Andrews as well as a giveaway for BEACH TOWN! MKA books are always fun. I'm looking forward to this one. Love to save Mary Kay Andrews books for beach reads.